Looking for a safe online casino that accepts real money players from the USA? Bovada.lv may be the answer for you. Well known for its online sports betting site, Bovada online casino has a large selection of slots, blackjack, roulette, video poker, other table games and specialty games. 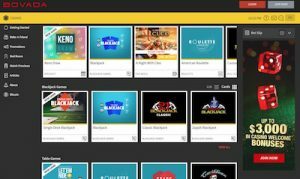 If you’re unsure whether this is the right casino site for you, the team at OnlineCasinoSites.com has thoroughly tested the gaming platform to bring you the nitty-gritty on Bovada Casino’s software, security and services. Bovada’s focus is on the North American market, catering exclusively to players from the United States. The USA enforces strict online gambling laws which means many American players end up handing their money over to dodgy, untrustworthy vendors, so Bovada presents a good choice for US punters looking for a safe and reputable place to play real money games. If you’re playing from a country other than the USA, read our informative country guides for more information about the online gambling laws in your area and the top-rated casino sites that accept players from your area. We recommend Bovada Casino as our top-rated casino site for players from United States, which has some excellent welcome bonuses available for new players and an impressive selection of real money casino games to choose from. $3000 Sign-Up Bonus – Get to $3,000 in matched deposit bonuses spread over your first three real money deposits by entering promo code ‘NEWWELCOME’ when making your deposits. Bovada will match each deposit by 100% up to $1000 each time. Refer-A-Friend Bonus – Recommend a friend to sign up with Bovada.lv by sending them a link and if they click to join and make a deposit, you’ll be rewarded with 200% of the value of your friends first real money deposit up to a value of US$100. Note: All casino bonus offers at Bovada come with wagering requirements attached, so make sure to always read the fine print before making a real money deposit. For example, the casino sign-up bonus and Bitcoin bonus both carry a 25X wagering requirement before any winnings made from the bonus money can be withdrawn. It is yor own responsibility to be aware of the play-through requirements that apply to you, so always be sure to read the fine print of any bonus offer before making a real money deposit. Regular players and high rollers who play at Bovada Casino can get access to the Red Room, an exclusive VIP area that elevates your Bovada experience to the next level, offering special treatment and exclusive benefits like weekly deposit bonuses, exclusive Red Room promo offers, convenient deposit options, free expedited withdrawals and a range of prizes. Bovada is an instant-play casino site, so no downloads are needed at any time to access the full range of online casino games. Just load the website as normal, click to select the game you want to play and it will load directly over your Web browser. Instant-play games can be trialled for free, or you can sign in to your account to make a deposit and play for the chance to win real money. A mobile-optimised casino site is also available for instant-play, offering a condensed selection of Bovada’s most popular games in an easy touch-screen format. Mobile games can be accessed using most modern smartphone and tablets with Internet capabilities. Bovada is a multi-provider casino, offering games from Real Time Gaming and Rival Gaming. These may not be the most advanced or celebrated casino gaming studios, but with USA players often shunned entirely from online casinos these software developers still present a good variety of games with a range of themes and special features. There are many more titles available, with hundreds of slots to choose from, so there’s plenty to keep you entertained. Amongst the game categories you will also find a ‘Guides’ link which provides information and overviews about how to play the different online casino games at Bovada along with the rules of each game and some popular strategies. Hovering over each individual game title will also give you the option of clicking ‘Learn More’ for a detailed description about each game. These are features rarely found at online casinos and certainly earns the site a few extra brownie points. A huge downfall of Bovada is that the casino doesn’t host any live dealer games. With live dealer games amongst the most popular titles at online casino sites these days, this will come as a disappointment to many online players. Read our live dealer guide to find out where else these advanced, entertaining live croupier games are available. Players at Bovada have very few options when it comes to depositing real money, with Visa, MasterCard and Bitcoin being the only choices. Visa Gift Cards are also accepted, but they must be authorised to allow international and online transactions at the time of purchase. Deposits made via credit card require a minimum of US$20 and are subject to a maximum of US$1,000, while Bitcoin deposits carry a minimum of US$20 and a maximum of $5000. A 5.9% processing fee will be charged on all deposits made with a Visa Card or a MasterCard. Withdrawals can be made using Bitcoin and Cheque by Courier only. Players are allowed one free withdrawal every 90 days, with a $100 processing fee applying for any additional withdrawals within the same period, which is a big thumbs down. For US players where options are limited, Bovada presents a good choice for those looking for a range of slots and classic casino games in a safe, instant-play platform, but this casino site isn’t without its downfalls. Withdrawal fees and limited deposit options may be a deterrent for some players, and it’s a bummer that live dealer games aren’t available. However, the welcome bonuses are good and there are some good ongoing promos and player rewards making this site well worth a try – be sure to read the terms and conditions before opting in. For alternatives, check out our USA online casino guide.